Syrian Government Claims Minimal Damage from Tripartite Attack - Integration Through Media ....! (VOA): The Syrian government condemned the targeted overnight airstrikes by the United States, France and Britain. Arab governments which oppose President Bashar al Assad, including Saudi Arabia, the United Arab Emirates and Qatar, expressed approval, while popular reaction in some Arab capitals appeared to be mixed. 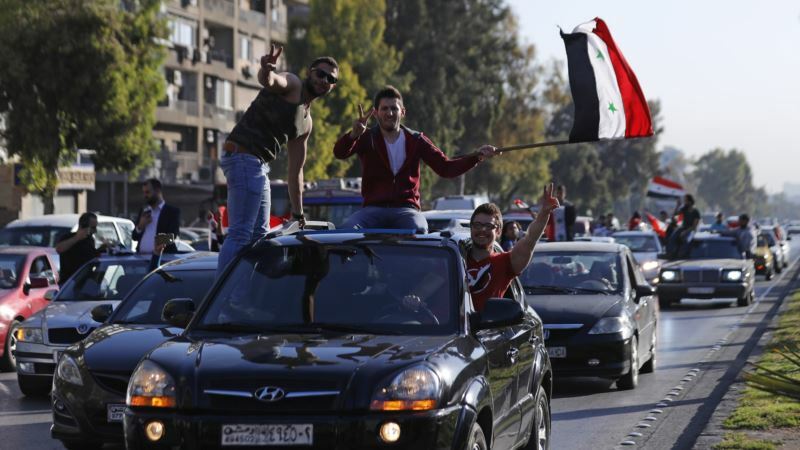 Syrian state TV showed supporters of President Bashar al Assad honking their car horns, waving Syrian flags and parading through iconic squares and arteries of the capital Damascus Saturday morning. The reaction followed airstrikes overnight by the United States, France and Britain. An official Syrian statement condemned what it called a "tyrannical, terrorist, tripartite aggression" against the Syrian government. The statement went on to decry the attack on the country as a "grave breach of international law." Government commentators claimed the series of missile strikes had caused "minimal damage," and that "many had missed their targets." Syrian TV showed video of the rubble of one target which appeared to have been destroyed by a missile strike. VOA could not independently confirm what was damaged by the strikes. Arab media opposed to the Assad government claimed an alleged chemical weapons research facility near Damascus was destroyed in the overnight strikes. A government commentator, however, claimed that damage was minimal. He says that government air defenses shot down many rockets and that only one target was hit at the government "Scientific Research Center." He also claimed that 80 percent of the rockets used in the strike were destroyed or missed their targets. Syrian government sources claimed that Russian-made S-100 and S-200 anti-missile systems shot down "many incoming missiles." State TV also stated that the most modern S-400 anti-missile air defense batteries "did not go into action, because none of the attacks fit the parameters of the S-400's capabilities." Syrian TV showed government supporters chanting slogans and waving flags in the Damascus suburb of Douma, which was the epicenter of an alleged government chemical weapons attack which reportedly killed dozens of civilians this past week. The television report showed footage claiming to show government military police entering Douma, Saturday morning. Officials from the United Arab Emirates, Saudi Arabia and Qatar expressed support for the strikes on Syrian government targets. Popular reaction in the Egyptian capital, Cairo, appeared to be mostly negative, while reports from the Lebanese capital, Beirut, say public opinion is divided.